The 2012 USA Cycling National Mountain Bike Championships on Baldy begin in earnest Thursday, July 5 and continue through Sunday, headquartered in the River Run area. Jump-starting the big event that will bring hundreds of bikers to Ketchum was a three-race series of fat tire races called the Sun Valley All-Mountain Challenge last weekend. The second of those races was Sunday’s Shimano Baldy Super Duper Downhill presented by Scott Sports for 88 contestants. Here, mountain bike pioneer Dave Harrison, 48, of Hailey and the Wild Rockies Racing team pushes across the 9,100-foot summit of Baldy in Sunday’s downhill before descending 3,000 vertical feet down the Warm Springs drainage to the finish at Apple’s Bar & Grill. 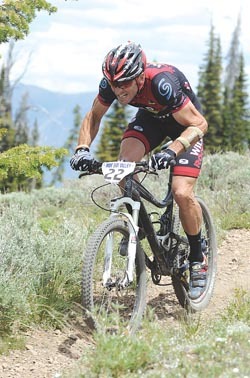 Harrison started racing mountain bikes professionally 25 years ago and has earned multiple Idaho cross-country titles. The former adventure racer and pro off-road triathlete cruised down Baldy in 32 minutes and 13 seconds, good for fourth place in the Pro-1 Men class.